The highlight of each April in the mystery-fiction community is a week of festivities and awards that begins as writers, fans, and publishers assemble in New York City in the lead-up to the Mystery Writers of America’s Edgar Allan Poe Awards banquet. For Edgars-week Tuesday, EQMM and its sister publication, AHMM, traditionally invite the magazines’ Readers Award winners and Edgar nominees to a small gathering in our offices. This year we had the pleasure of hosting EQMM Edgar nominee (and MWA president) Jeffery Deaver; EQMM Readers Award winners Brendan DuBois and Doug Allyn, as well as Doug’s wife, Eve; AHMM Edgar nominee S.J. Rozan; and one of this year’s three MWA Grand Masters, Peter Lovesey. Most of us went directly from this small Dell-office tea party to the big annual cocktail party thrown by Otto Penzler’s Mysterious Bookshop—the perfect place to spot other authors newly arrived from out of town. L to R: Jeffery Deaver, Doug Allyn, Eve Allyn at the Dell Magazines office. Photo by Jackie Sherbow. L to R: S.J. Rozan, Janet Hutchings. Photo by Jackie Sherbow. L to R: Peter Lovesey, Brendan DuBois, AHMM editor Linda Landrigan. Photo by Jackie Sherbow. L to R: Eve Allyn, Peter Lovesey, Doug Allyn at the Mysterious Bookshop. Photo by Jackie Sherbow. Wednesdays during Edgars week are usually marked by a day-long symposium with panels and interviews featuring the various Edgar Allan Poe Award nominees, the Grand Masters, and the Raven and Ellery Queen award winners. 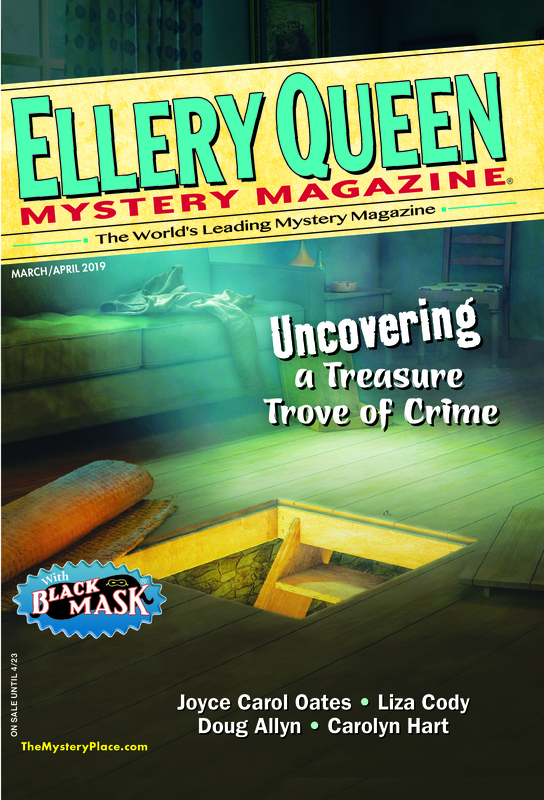 As in past years, associate editor Jackie Sherbow attended for the Dell Mystery Magazines. Oline Cogdill with Peter Lovesey during his Grand Master interview at the MWA Edgar Awards Symposium. Before we knew it, the big day—Thursday—had arrived. For thirty-three years, EQMM and AHMM have hosted a cocktail party prior to the Edgar Awards banquet. It’s here that the EQMM Readers Awards are presented annually. And it’s here that we have the best chance each year to catch up with some of our closest friends in the business, a number of whom are pictured below. Richard Dannay. Photo by Ché Ryback. L to R: Brendan DuBois, Otto Penzler. Photo by Ché Ryback. L to R: Associate editor Jackie Sherbow, Hilary Davidson. Photo by Ché Ryback. Nancy Novick. Photo by Ché Ryback. Dave Zeltserman accepts his third-place EQMM Readers Award scroll, presented by Janet Hutchings (pictured) and Peter Kanter. Photo by Ché Ryback. Doug Allyn accepts his second-place EQMM Readers Award scroll. Photo by Ché Ryback. Brendan DuBois accepts the 2017 EQMM Readers Award. Photo by Ché Ryback. L to R: Shelley Costa, Linda Landrigan, Angela Zeman, Barry Zeman. Photo by Ché Ryback. L to R: Kevin Egan, Analog and Asimov‘s associate editor Emily Hockaday. Photo by Ché Ryback. Penny Publications/Dell Magazines publisher, Peter Kanter. Photo by Ché Ryback. L to R: Kristopher Zgorski, Gregory Day, Lori Rader-Day. Photo by Ché Ryback. L to R: Joseph Goodrich, Dale Andrews. Photo by Ché Ryback. L to R: Michele Slung and Vicky Bijur. Photo by Ché Ryback. L to R: Analog Science Fiction and Fact editor Trevor Quachri, Dell Magazines/Penny Publications vice president Christine Begley. Photo by Ché Ryback. L to R: Jane Cleland, Hilary Davidson, Meredith Anthony. Photo by Ché Ryback. L to R: James Lincoln Warren, Dale Andrews, Brian Skupin. Photo by Ché Ryback. Dell Magazines editor Mark Lagasse. Photo by Ché Ryback. L to R: Jim Weikart, Steve Steinbock. Photo by Ché Ryback. L to R: Robin Dean, V.S. Kemanis, David Dean. Photo by Ché Ryback. Kate Stine. Photo by Ché Ryback. Dell Magazines systems/IT manager, photographer Ché Ryback. Photo by Jackie Sherbow. EQMM was present at the very first Edgar Allan Poe Awards dinner, seventy-two years ago. Many of the banquets since then have had an extra dash of excitement for us as we awaited the results of the best short story award, for which we had nominees. This year was no exception. But what made the evening even more memorable was that two of the three writers named Grand Masters of the Mystery Writers of America had close connections to EQMM. William Link got his start in EQMM’s Department of First Stories in 1954, with a story cowritten with Richard Levinson. The pair went on to create several hugely popular crime TV shows, including Columbo and Murder, She Wrote. New Grand Master Peter Lovesey, who’s been writing regularly for EQMM since 1979, is a past winner of the EQMM Readers Award, among many other distinctions (including the Cartier Diamond Dagger for Lifetime Achievement). I had the great honor of presenting him with the Grand Master Edgar! Janet Hutchings and Peter Lovesey with his Edgar Award. Peter Lovesey and William Link at the Edgar Awards banquet. Before the glitter and glamour of the black-tie Edgars seemed to have fully dissipated, many of us were on our way to the week’s next stop: North Bethesda, Maryland, for the annual Malice Domestic Convention. A convocation of fans and writers of the traditional mystery, Malice is scheduled immediately following the Edgars so that those traveling from abroad or from distant points in the U.S. can attend both sets of events. For me, Malice began on Friday evening, with a dinner in the Pike & Rose development in North Bethesda, with authors Dana Cameron, Frankie Y. Bailey, Christine Poulson, Dale Andrews, and Josh and Laurie Pachter. At subsequent meals (one also pictured below), I had the pleasure of reconnecting with a number of the talented people who contribute fiction, reviews, and nonfiction to our pages, including Doug Greene, the founder of Crippen & Landru, the genre’s leading publisher of single-author short-story collections, and Jeffrey Marks, who has recently taken over as Crippen & Landru’s publisher. Clockwise from L: Josh Pachter, Janet Hutchings, Dale Andrews, Dana Cameron, Frankie Y. Bailey, Laurie Pachter, Christine Poulson. Clockwise from L: Toni L. P. Kelner, Janet Hutchings, Art Taylor, Tara Laskowski, Con Lehane, Shelly Dickson Carr. L to R: Jackie Sherbow, Steve Steinbock, Josh Pachter, Alan Orloff. As always, a wonderful recap of a wonderful week of events. Thanks, Janet! Such great pictures! And so fun to see you at Malice, Janet, Linda, and Jackie! Great reporting with nice photographs. Maybe you misspelt Michele Slung’s name (with “l”)? Yes, thanks, Jiro. A typo at our end, which we will correct!